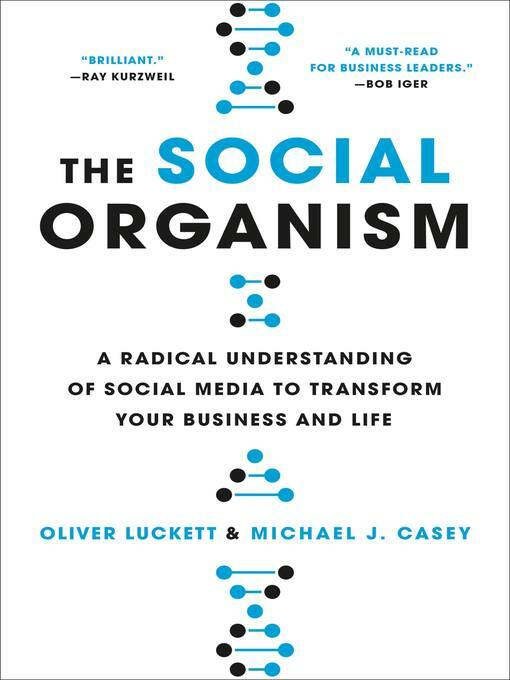 From tech visionaries Oliver Luckett and Michael J. Casey, a groundbreaking, must-read theory of social media — how it works, how it's changing human life, and how we can master it for good and for profit. How did this happen? The scope and pace of these changes have left traditional businesses — and their old-guard marketing gatekeepers — bewildered. We simply do not comprehend social media's form, function, and possibilities. It's time we did. In The Social Organism, Luckett and Casey offer a revolutionary theory: social networks — to an astonishing degree — mimic the rules and functions of biological life. In sharing and replicating packets of information known as memes, the world's social media users are facilitating an evolutionary process just like the transfer of genetic information in living things. Memes are the basic building blocks of our culture, our social DNA. To master social media — and to make online content that impacts the world — you must start with the Social Organism. With the scope and ambition of The Second Machine Age and James Gleick's The Information, The Social Organism is an indispensable guide for business leaders, marketing professionals, and anyone serious about understanding our digital world — a guide not just to social media, but to human life today and where it is headed next.